Hey everyone and thanks for joining me for another Monday Money! Today, I want to discuss a couple of credit cards that are known to improve your credit score. I want to go over this because misconceptions of both of these cards have lead many people down a road of nothing more than frustration and further harmed credit scores. But, in all actuality, if the right person is using the right one of these cards properly, it can really help. So, which is it? Well, the answer is, both. As I’ve said tons of times before, every different financial option that you come across is going to benefit a specific, niche group of consumers more than it will benefit anyone else. The bottom line is, financial products have to be more than financial products. They have to really grab the attention of a specific market to take hold. Both of these options do a very good job of that. So, I’ve read scam reports, BBB reports and hateful articles all aimed at this option. The truth is, those who are writing those reports really should be mad at themselves as, they were obviously not the right candidate for the card! It didn’t provide what they were looking for so they got upset. But, had they compared their options properly, they would have known that before they ever applied. That being said, the Horizon Gold Card definitely isn’t a best fit for everyone and really is only appealing to a small percentage of people who would like to improve their credit scores. This is because the horizon gold card charges a monthly fee of almost $35 and, it’s not a Visa, MasterCard, Discover or even American Express, it’s a merchandise card. It can only be used at the Horizon Gold Merchandise store online. Also, they don’t report to all three major credit reporting agencies, only TransUnion. So, after having the card for 2 or 3 months, you will need to write a letter to Equifax and Experian to inform them of it’s existence. So, Why Would You Want A Horizon Gold Card? If you’re one of those people who gets a good amount of money and it burns a hole in your pocket. This is a perfect option for you in an attempt to create good credit lines. If you have a card that can be accepted anywhere, you may loose control of your balance and, that wouldn’t be good for your credit at all! Having a card that can’t be used often will help you to ensure you don’t keep a balance on it. Even if you don’t use your Horizon Gold Card, the open credit line will help your credit. After about 6 months, they have a tenancy of increasing credit limits to $3,000 which really bumps up credit a bit! I haven’t seen as many complaints about the First Progress secured credit card as I have with the Horizon Gold Card. But, I’d imagine that’s because the First Progress secured card is one of those cards that can be used just about everywhere. It’s a MasterCard! Being that the First Progress card is a MasterCard and can be used anywhere, it’s important to only use this card if you feel you can maintain control of your balance! It is much easier to mess up with this one than with the Horizon Gold Card. But, if you are confident in your money management skills, this is definitely the better option. If you’d like to go this route, there are a few things that you’re going to need to know. First off, the First Progress card is a secured credit card and requires a deposit before use. The deposit can range from $300 to a few thousand dollars depending on how much of a credit limit you would like. Of course, the deposit is refundable! Also, because it’s so easy to spend money using this card, you want to keep a very close eye on your balance. It’s not a good thing to spend more than 50% of your credit limit on any revolving credit line. Doing so could be early signs of financial hardship and will do nothing good for your credit scores! Finally, if you’re going to use this card, you want to make sure to pay the balance off every month. As with most credit cards designed for consumers with no or poor credit scores, the First Progress credit card has a less than desirable interest rate. But, if you pay your balance off each month, you won’t have to pay that rate! Well, that’s about it for today, I hope you’ve enjoyed this week’s Monday Money! If you have any comments, questions or concerns, feel free to drop me a line below…I promise to respond! 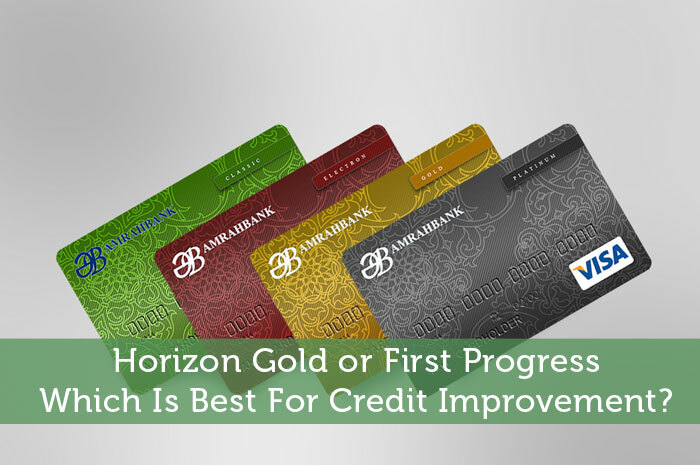 Horizon Gold or First Progress, Which Is Best For Credit Improvement?